“Do you know why they call that place Death Valley?” “What will we find there?” “Why are Mesquite Flat Sand Dunes so popular?” Questions like these constantly bombarded our minds on a Saturday morning while we were crossing hundreds of miles of deserted California land. 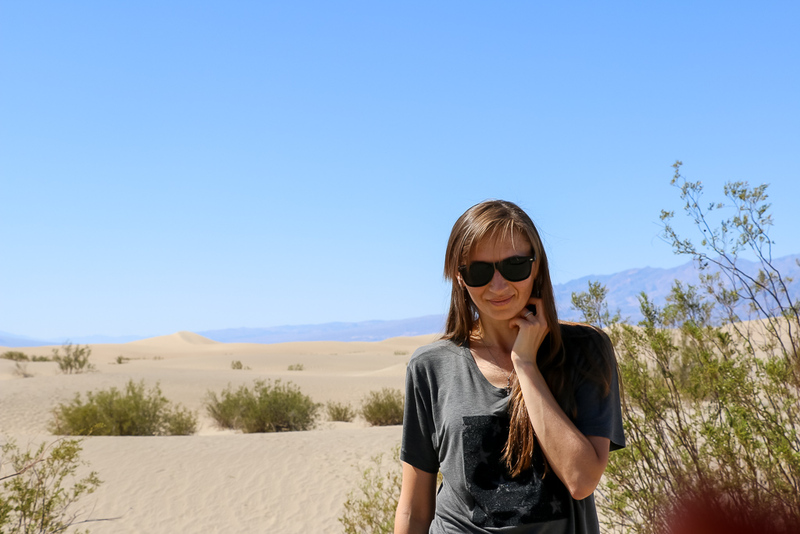 To begin with, we were not particularly interested in the Death Valley Desert itself. Heading east, in the direction toward the state of Nevada, outside of major cities such as Los Angeles(where we started our journey from), Palmdale and Lancaster, the California landscape remains pretty much unchanged. A vast territory of barren land mixed with rocky hills and steep mountains disturbed only by never-ending concrete roads and occasional cars, racing at high speed. And still, despite the lack of the diversity of the terrain, we ventured east to Death Valley National Park. 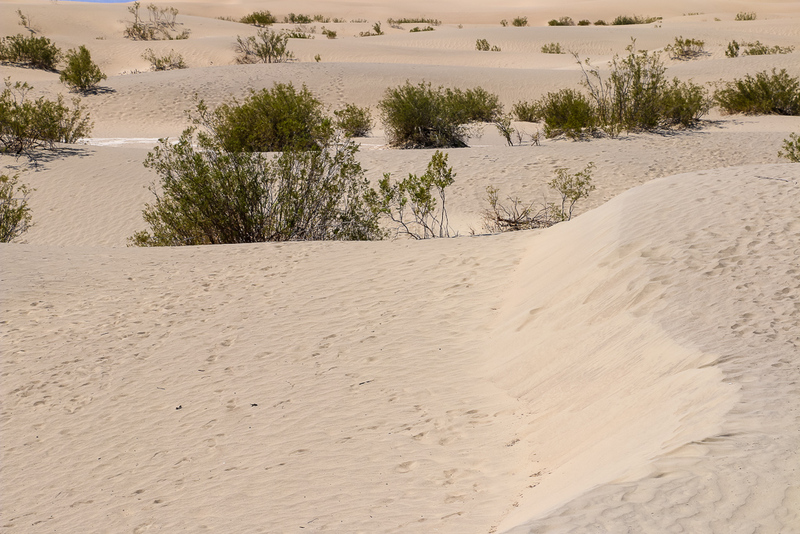 With just one intent – to see Mesquite Flat Sand Dunes. 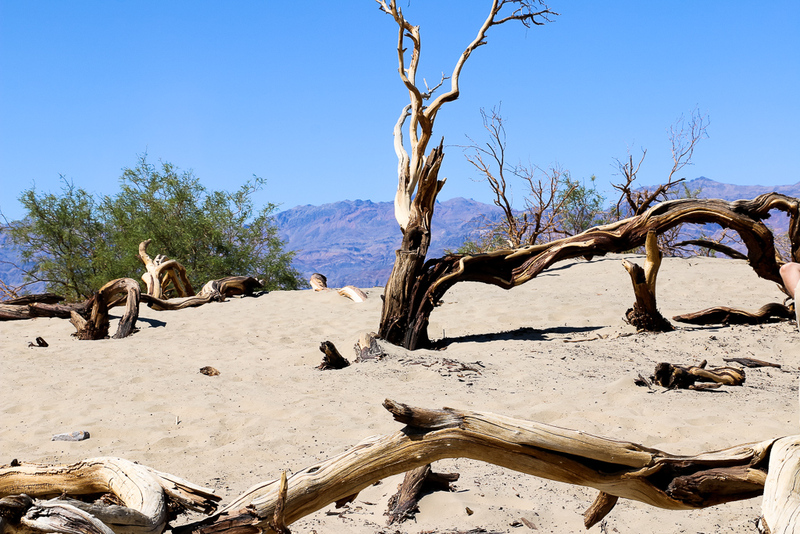 The Mesquite Flat Sand Dunes are not the only sand accumulations in Death Valley, the hottest and driest place in the United States. Along with these white sand dunes, four other dunes, with the Eureka Dunes being the tallest, find their home in the park. Sadly, together they compose only one percent of the desert. Isn’t it this number way too low for a typical desert that we are used to picture in our minds? Absolutely! However, the fifth largest national park in the country (after 4 national parks located in Alaska), has little to do with a stereotypical desert covered with endless mountains of golden sand. 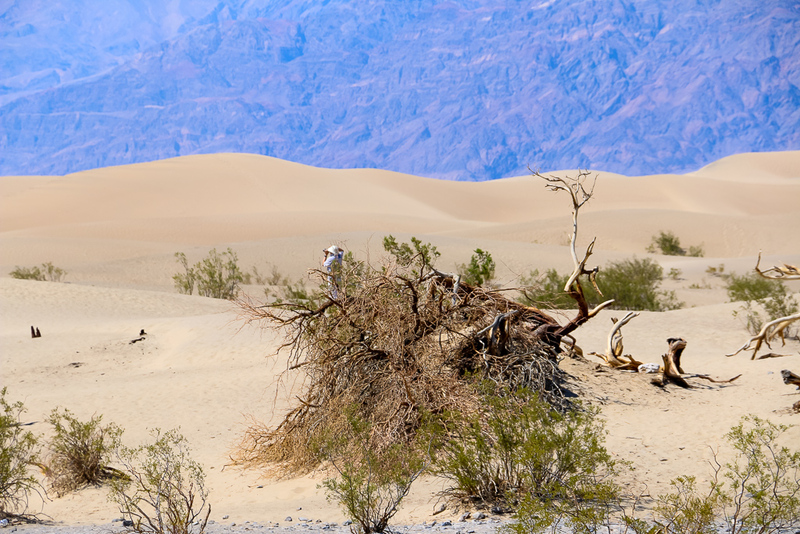 Similar to the majority of other deserts, the strong wind of Death Valley continuously moves huge masses of the sands provided by the eroded canyons. 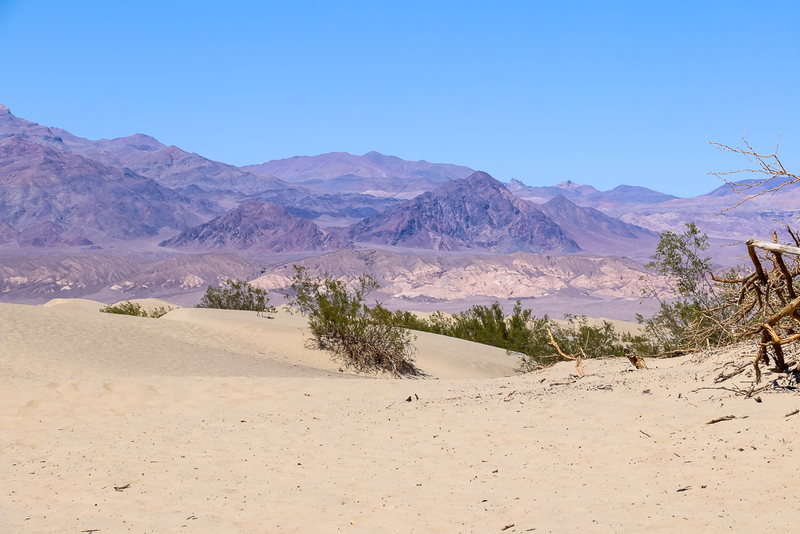 But only a few areas in the park are capable to capture the swirling sand and end their nomadic life between the desert mountains, creating the dunes. Strong wind of Death Valley continuously moves huge masses of the sands provided by the eroded canyons. Besides the sand dunes, the 3.3 million acres park encompasses below-sea-level salt flats, sandstone canyons, and sliding rocks of Racetrack Playa, a dry lake bed in Death Valley. Such diversity of the terrain is also responsible for the extremes in elevations. So, for example, Badwater Basin, the lowest spot in the park goes as low as 282 feet below sea level white Telescope Peak reaches the height of 11,049 feet. Moreover, the extremes surpass the elevation and spread out over the temperature. Usually dangerously cold winter months get replaced by summer with its scorching sun. It is well-known that the extreme summer heat has killed people in the past. Such a huge and, what appears after all, unique place asks for at least a couple of days to feel and explore it. But at this time all we were focused on were the Mesquite Flat Sand Dunes. Four hours of driving through the unchanging landscape seemed to never come to the end. Guessing what we could find at our final destination helped pass the time while simultaneously entertain us. It also assisted us with dispelling unbearable boredom, which gradually began to oppress the situation in the car. Periodically, we glanced at a car thermometer, which diligently showed slightly high number with every dozen miles we were leaving behind. Finally, a few hours later and at the temperature of 115 degrees Fahrenheit, we spotted the impossible to escape sight of the white sand. Piling up in 100 feet hills, the famous dunes instantly tempted you to burry your feet in its warm sandy waves. But the Mesquite Flat Sand Dunes happened to be two-sided saw. They offered pleasure to eyes, on one hand, and challenge to body, on the other hand. Still, appearing like a desert dream, the dunes enticed and captivated, promising a sandy adventure. After paying $30 entrance fees at self-help station near the entrance gate and parking our car on the opposite side of the parking lot separated from the dunes only by a narrow strip of land, we were ready for the exploit. One thing that we learned shortly after crossing the parking lot and approaching the dunes was that you should never go to a desert in summer. Or at least limit your visit to a few hours before or after sunrise or sunset. Let me explain why by sharing our shortest, yet one of the most memorable adventures. The realization of how hot the place was came as soon as we step on the white sand. However, those few first steps only ignited our curiosity and adventurous spirits. The whole picture and full comprehension of the extent of the heat came later. Walking farther away from the safe haven of the parking lot, I felt the sand slowly filling my ballet flats. Was it my overacted mind inflamed with excitement or was the sand really so hot? I felt like those few sand grains inside my shoes burned my skin like a fire. At least, this feeling did not last long. Only until the body temperature cooled the sand down and from that point all I could feel was just slight irritation that you normally get when you have some foreign objects inside your shoes. This slightly burning sensation was tenfold acute for my husband. Despite common sense, he chose to wear slippers that left his feet completely exposed to the sand. Yes, I have to admit it was a bit uncomfortable for both of us, but still manageable. Appearing like a desert dream, the dunes enticed and captivated, promising a sandy adventure. Forgetting about the initial inconveniences, at that point I already had my sights set on a pristine dune in the far end. Distanced from other random visitors by numerous smaller dunes, it looked like a queen-dune. A dune that pops up in your imagination every time you hear the word “desert”. Oh man… That was a disaster! With scorching sun above our heads and burning sand beneath our feet, we started walking down the dune. A few steps toward the bottom were enough for the pitiless desert sand hurriedly swallow our feet, toasting them from all possible angles. We literally felt like we were on fire. Complying with kicked in survivor instinct, I was vigorously shaking one leg after another in attempt to get rid of the sand trapped inside my unfortunate flats. One strenuous movement – and one of my shoes slipped off and flew a few inches away. Ouch… Not the best time for it at all. Instantly pulling up the barefoot leg as high as I could, I froze. But how long can you stand on one leg especially when it is burning? Enduring the pain and exhausting heat, I started running with my bare foot directly touching the agonizing sand. A few seconds later, I managed to rescue my shoe, lonely buried in the near distance. Oh, I got it! This is why they call this place Death Valley! The answer to the question we asked ourselves in the car a few hours earlier came in the least expected form. The name was not just an impressive metaphor or word game. It was real! The danger and the deadly heat were also real! No more than two-three minutes later (that, frankly, seemed like an eternity), in the comfort of the car, we turned on AC to the maximum level and gratefully embraced the cold air. And then, all of a sudden, we started laughing. With exhilaration, without any restraints… With salty drops of sweat dripping down our faces, we looked back at the dunes. How can’t you admire them? So pristine and majestic! Despite our misfortunate endeavor to conquer them, we still loved them (probably even more than before). We admired the desert and were grateful for this short, yet unforgettable experience. Aha moment! The name of Death Valley was not just an impressive metaphor or word game. It was real! The danger and the deadly heat were also real! Few more minutes passed. Completely restoring our energy and starting thinking rationally, we attempted one more short visit to our beloved dunes. A couple of family pictures to memorize the experience seemed like a must at that point. Despite the heat, the desert did not suffer from the lack of the visitors. And thus, finding a person to take our picture was even easier than doing it at the Palace of Versailles in France. With a few words, my husband approached a South Asian man who at full speed was rushing to his car. (Exactly like we did a few moments ago.) Unknowingly to himself, the man did a great job in capturing our perfect moment at the Mesquite Flat Sand Dunes. But before he returned my phone, he sincerely apologized and hoped that the pictures came out good. He tried his best, but because of the heat he could not focus. With such explanation and a big smile to compensate for his quick departure, our “photographer” hurried to the safety of this car. Completely understandable! I have seen people rapidly hiding inside, whether a building or a car, to escape fast grasps of the cold. But never before the cause of such behavior have been linked to the mighty warmth (read heat) of the sun. Should have we blamed our lack of preparation for this highly enjoyable Death Valley and Mesquite Flat Sand Dunes misadventure? We surely could have done it. We and only we failed to do a quick research and anticipate the conditions of the desert at 110 degrees Fahrenheit. Were we upset or disappointed with the outcome of this excursion? Not at all! Yes, the things did not go the way we had planned, but the experience was worth it. 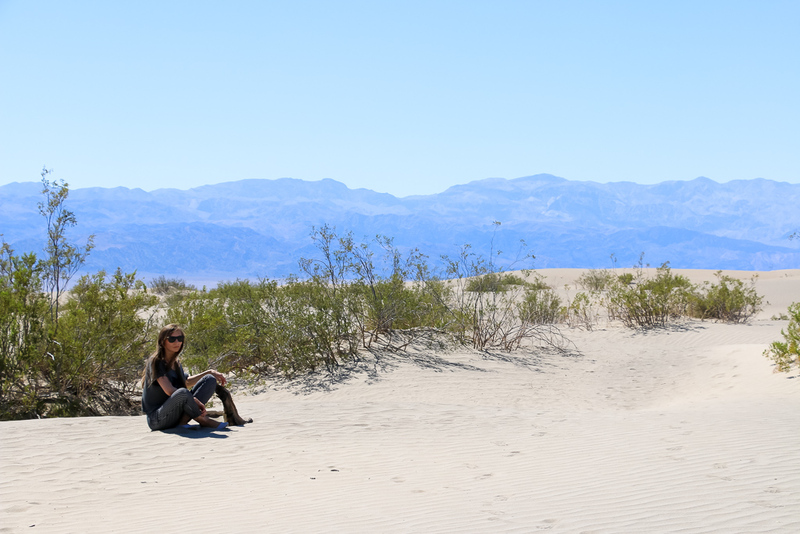 The chances are, we will not have similar adventures in the future (at least, we will try not to), but it would have feel terribly wrong to have it different way on this trip to the heart of Death Valley – the Mesquite Flat Sand Dunes.